Your UNISON stewards are meeting today to discuss Cornerstones shameful decision to de-recognise UNISON. We have listened to our members concerns and will continue to speak with one voice on behalf of you, our colleagues in UNISON. We are outraged at the implication that your high standards of care are somehow impacted by your involvement in UNISON. Such comments should be beneath the Leadership Team of a care charity. Look out for regular updates and action points for you all as we fight together to overturn this decision through an application for statutory recognition. If you have been unsure about joining UNISON to this point, now’s the time to come on board. 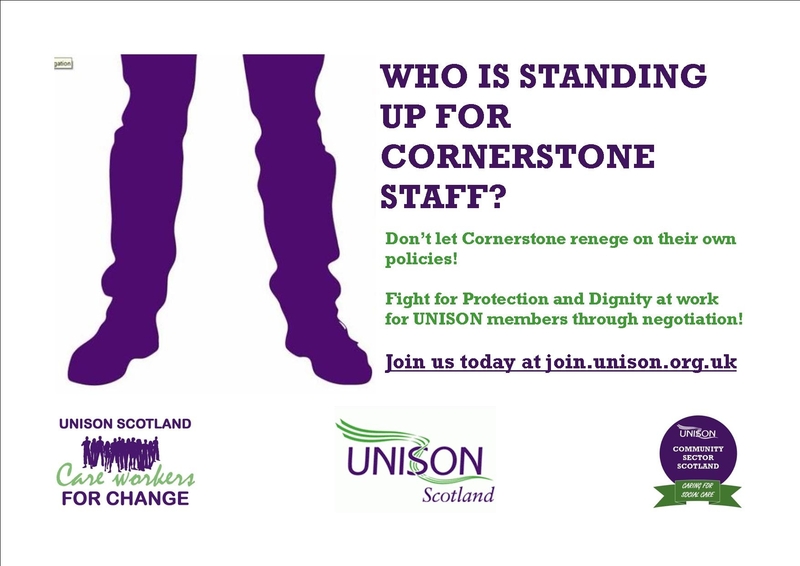 UNISON’s 1.4m members are right behind you in Cornerstone – is that a high enough number for the Leadership Team? Previous Post:UNISON statement on Cornerstone decision to de-recognise.